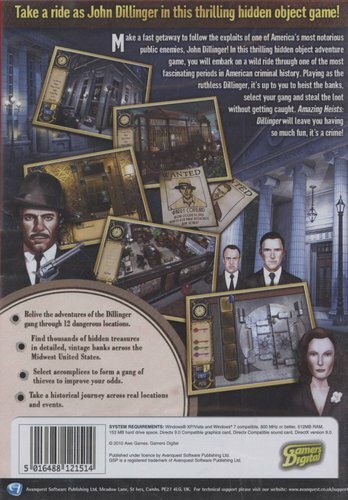 Take a ride as John Dillinger in this thrilling hidden object adventure game! 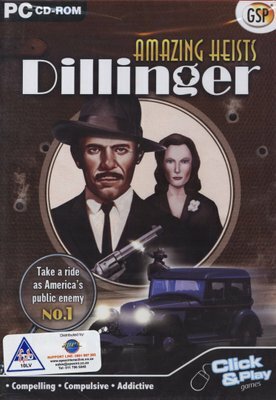 Make a fast getaway to follow the exploits of one of America's most notorious public enemies, John Dillinger! In this thrilling hidden-object adventure game, you will embark on a wild ride through one of the most fascinating periods in American criminal history. Playing as the ruthless Dillinger, it's up to you to heist the banks, select your gang and steal the loot without getting caught. Amazing Heists: Dillinger will leave you having so much fun, it's a crime! Relive the adventures of the Dillinger gang through 12 dangerous locations. Find thousaNDS of hidden treasures in detailed, vintage banks across the Midwest United States. Select accomplices to form a gang of thieves to improve your odds. Take a historical journey across real locations and events.